Installation of locks is a common do-it-yourself project. According to market information, less than 7 percent of the total retail lock business is from locksmiths. A large percentage of consumers shop retail stores for locks. The five mechanical types of key-operated locks are pin-tumbler, lever-tumbler, disc-tumbler, warded and combination locks. Pin-tumbler locks with five or more pins offer greater resistance to picking. Depending on the number of pins, this lock offers many key changes. These locks can be made with as few as three pins but better locks have five or more. Pin-tumbler mechanisms are used in padlocks, deadbolts, cabinet locks, locksets and more. Lever-tumbler locks are slightly less expensive than pin-tumbler locks, offer good security and many key changes. Lever-tumbler key blanks are rarely stocked. These locks are usually found on doors of older homes. Disc-tumbler locks are medium-priced locks offering minimal security and many key changes. Warded locks feature low-cost but superior weather resistance because of simple construction and lack of rotating internal parts. However, they provide only token security. Combination locks offer good security and wide price range to appeal to homeowners and commercial users. Uses vary from bicycles to bank vaults. Basic locks are an integral part of a house or building: auxiliary locks are devices like night latches and door chains used as “backup” security for basic locks. Bored locksets are part of the basic door hardware with the locking mechanism built into the doorknob and latch. They are classified as entry, hall/closet passage locksets and bath/bedroom privacy locksets. Entry locksets are locked or unlocked from the inside by turning or depressing a small button on the inside knob. A key is required to unlock the pin-tumbler mechanism from the outside. Sets requiring a key on both the inside and outside are available for added security. A quality feature in an entry lockset is the deadlatch. Because the regular latch is angled to the outside of the door, an intruder can depress it by sliding a piece of stiff material between the door and the frame. The deadlatch actuator is generally located in the rear of the regular latch and cannot be depressed in this manner (when installed properly). A lockset that automatically unlocks when the inside knob is turned is good for the homeowner who doesn’t want to lock himself out of the house or one of the rooms. Bathroom and bedroom privacy latchsets are designed for privacy rather than security and are equipped with a locking button on the inside but no key device on the outside. In an emergency, the lock can be opened from the outside by inserting a narrow object through the small hole in the outside knob and either depressing or turning the locking mechanism inside, depending on the type of lock. Mortise cylinder locks have a pin-tumbler locking mechanism in a cylinder. The latch can be operated from either side except when the outside knob is locked. A deadbolt is also used and operates by a turn of the inside knob. Both deadbolt and latchbolt can be operated by a key from the outside. Mortise cylinder locksets are used in new installations and as replacements; they are mortised into the frame of the door. They can be used on many types of doors from heavy entrance doors to apartment buildings to residential doors. Some of these locksets can be used on vestibule doors; in this case they have a latch and deadbolt or latch only. Padlocks provide portable security for movable objects-bicycles, motorcycles, boats and the like-and in locations such as storage sheds, gates, etc. where locksets are not practical. Although weatherproof construction is important, high security is more important to the consumer who wants to protect expensive equipment. Laminated, pin-tumbler padlocks provide maximum security for valuables. Laminated (layered-steel) padlocks are virtually indestructible. Hardened solid steel and steel alloys make better locks and shackles; solid extruded brass padlocks are more resistant to rust than steel, but can be damaged because brass is softer than steel. Padlocks with five or more pin tumblers offer increased security against picking and are probably more secure than combination locks. Re-keyable padlocks are generally used for commercial and industrial security needs. 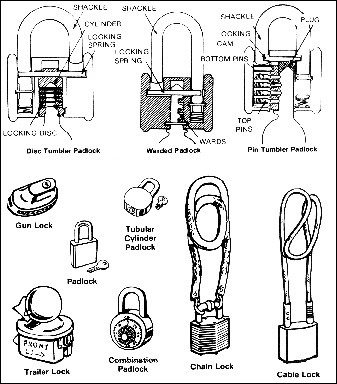 Tubular cylinder padlocks offer many key changes by replacing the cylinder. Although most often used in electronic security systems, tubular cylinder padlocks are also used by owners of motorcycles and expensive bicycles. Cable, chain and long-shackle padlocks are commonly used as bicycle locks but may not provide adequate protection for expensive bikes. A cable or chain with a separate lock could be recommended for greater protection. U-bar locks provide maximum protection for expensive bikes. Padlocks with chain or cable permanently attached to the shackle are versatile locks but cable or chain and shackle must be matched in strength and diameter to the lock. Trailer locks are used to secure standing trailers by rendering the towing device inoperative. The lock covers or fills the coupler socket so that it cannot be mounted on ball. Jimmy-proof locks use an interlocking bolt mechanism to give maximum security. Additional security comes from two interlocking vertical bits that engage the strike when the lock is closed. This means the door cannot be pried open because there is no room between the jamb and the door for a pry bar. Some jimmy-proof locks come with a guard that prevents the lock from being opened with a screwdriver from the outside. This guard is a steel plate that is drawn back on a spring when the lock is installed. If the cylinder is pulled out from the outside of the door, the guard springs across the opening. It is also a good idea to suggest one-way tamperproof screws be used with double-cylinder jimmy-proof locks. A deadbolt lock backs up a lockset on entry doors to provide maximum security. The word “dead” refers to the fact that there are no springs to operate the bolt. It is locked or unlocked manually by a key or thumbturn on the inside. There are a number of configurations for deadbolts including those incorporating deadbolts into conventional key-in-the-knob locksets. Better units have a stainless-steel bolt with a roller insert to resist sawing and cutting. The industry standard requirements are 1″ for bolt throw. The bolt locks the door to the frame and the extra-long bolt gives deeper penetration into the door frame and helps prevent the door from being pried open. Deadbolts with throws one inch or longer give greater security; mounting a one-inch or longer throw deadbolt with 3″ screws to engage the trim stud increases the security. The housing should also resist hammering or wrenching. A single-cylinder deadbolt which is key operated from the outside is fine for solid metal or wood doors for greater security. Doors with glass require a double-cylinder deadbolt with key operation both inside and out. This prevents someone from breaking the glass, reaching in and unlocking the door. Anyone purchasing a double-cylinder deadbolt should be cautioned to always keep the inside key in the lock when they are home. In case of fire or other emergency, the danger of a double-cylinder lock is that the key will be missing. Hasp consists of a metal hinge and an anchoring bolt (loop), so locks can be secured to gates, sheds and garages. High-security hasps will have anchored eyebolts, pinless hinges and hidden screws. A padlock is inserted through the bolt and locked to secure the hasp. Some hasps-called hasplocks-have padlocks attached to them. This makes it impossible to lose the locks when gates or doors are opened. To unlock the hasplock, the padlock portion is operated by a key and turned a quarter turn; a quarter turn in the opposite direction locks and secures the hasp. Night latches have an automatic locking feature. The lock bolt is made on a 45° angle and retracts inside the case when hitting the keeper, thus locking the latch automatically. Sliding-lock mechanism to provide minimal security for average weight doors. Can also be used on windows. Available in decorative finishes and with surface or universal strikes. Some have spring action to hold bolt in place. A keyed sash lock mounts like a regular sash lock, but with one-way screws to discourage removal. Lock can be released only by key. If window is broken, sash still cannot be opened. Can be supplied with master-key arrangement. Used on windows and designed to allow slight opening for ventilation. Easily installed. Hotels are now using electronic locks with credit card-sized paper replacing keys. Watch for them to move into the home market. Reinforcement hardware are metal plates designed to give added strength to deadbolt and key-in locks. The plates are installed around existing locks. The plates are designed to prevent forced entries by making critical stress areas around the door and framing more secure. Latch guards for in-opening doors help reinforce the door and frame and prevent spreading of the frame. A standard 7″ latch guard fits all backsets, deadbolts and key-in knob locks. A 12″ latch guard for in-opening doors also fits all double locks, mortise locks and access control locks. Latch guards for out-opening doors protect the latch or bolt. Several sizes and types are available, ranging from a 6″ model designed to fit all backsets, deadbolts and key-in knob locks, on up to a 12″ latch guard for out-opening narrow stile doors. Alarms used with electronic security systems range from a simple buzzer built into the device to systems with direct contact to local police stations. Because of the high number of false alarms, however, some police departments refuse to respond to home alarms. Types of alarms depend upon personal preferences. Some feel that a loud alarm at the point of entry will scare off an intruder. Others prefer a remote alarm located in a bedroom so that homeowners can be warned without alerting the intruder that he has been detected. Others prefer an outside alarm so that the intruder knows neighbors are aware of his presence and are likely to call the police. Simple alarms may consist of no more than a door-locking device with a buzzer attached. When the device is tampered with or the door opened when the alarm is set, it sounds. Such a device may be adequate for a second-story apartment with one entry door. However, most home intrusion alarms are more elaborate. There are two basic systems. One, called a perimeter system, detects intrusion at points of entry-doors and windows. The other, an area alarm, detects motion inside a room. Some alarms offer special features like a medical alert alarm that can be worn or carried. Others include heat sensors and a smoke alarm. Systems like this can qualify consumers for a homeowners insurance discount, sometimes as much as 10 percent. Some perimeter systems employ low-voltage wire, similar to stereo speaker wire, to connect magnetic window and door sensors to a control panel. Others use individual radio transmitters at each door and window sensors to trigger an alarm at the control panel. When a door or window is opened, the switch is activated and the alarm sounds. Since perimeter systems designed for do-it-yourself installation are frequently battery powered, ease in testing the batteries can be an important factor. A dead battery renders the alarm useless, so frequent testing is vital. Some systems sound a warning when batteries begin to lose their charge. In the case of a wired system, pushing a control-panel button checks the entire system. In a wireless system, each transmitter has its own battery and must be individually checked and all batteries must be replaced periodically. Some battery-powered units are combined with smoke, gas and medical emergency alarms to provide complete protection from one control unit. Area alarms generally plug into standard 115V electrical outlets; hence, they are simple to install. Most use either ultrasonic (inaudible sound) waves or microwaves to detect motion. When motion in the area triggers the detector, the unit sounds a loud horn or siren. They are usually more expensive than other systems. At least one system offers a battery-operated, portable unit that detects motion in a narrow field over a 10 range and sounds a loud alarm. It can be carried and used in hotels, etc. Ultrasonic detector waves go only as far as the walls of a room, while microwaves will penetrate walls and windows. This can be an advantage if detector coverage of several rooms is desired. However, this same spill-over effect greatly increases the chances of false alarms in small living areas such as apartments where people may be moving in adjacent quarters or hallways. Some types of ultrasonic area alarms utilize a narrow sonic beam that must be bounced off a hard wall surface, perpendicular to the beam. An intruder has to “break” that narrow beam before the alarm sounds. Some care must be taken in positioning this type of unit to make certain the reflected signal does indeed return to the detector, to be sure it will detect the intruder. Other ultrasonic units use a wide beam that virtually fills the area and detects motion anywhere in the trap zone. This design is easier to set up and is free from accidental misalignment if bumped or moved slightly since aiming of the beam is not critical. Most area alarm systems require some adjustment after they have been placed in a room in order to achieve the right strength signal to protect that area. Better systems are self-adjusting to assure reliable detection and forestall false alarms due to poor setting by the owner. Perhaps the most important consideration in an area alarm is avoiding false alarms. These can be caused by air conditioners, drapery moving above a hot air register or even a telephone ringing. Better, newer systems have circuitry built in that discriminates against these spurious signals to safeguard against false alarms. Among the options available in some advanced area alarm systems are wireless repeater alarms (or “satellites”). Satellites can be plugged in anywhere in the home to generate additional noise and to relay the warning to remote bedrooms. The instant the area alarm detects an intruder, a signal is transmitted via regular household wiring to sound the satellite. This can even be placed in a neighboring house to alert residents to an intrusion next door during vacations or absences, so they can call police on behalf of the alarm owner. Some area systems can also be connected to door and window sensors to provide perimeter protection as well as area coverage. Outdoor sirens are also available to alert the whole neighborhood in the event of an intrusion.